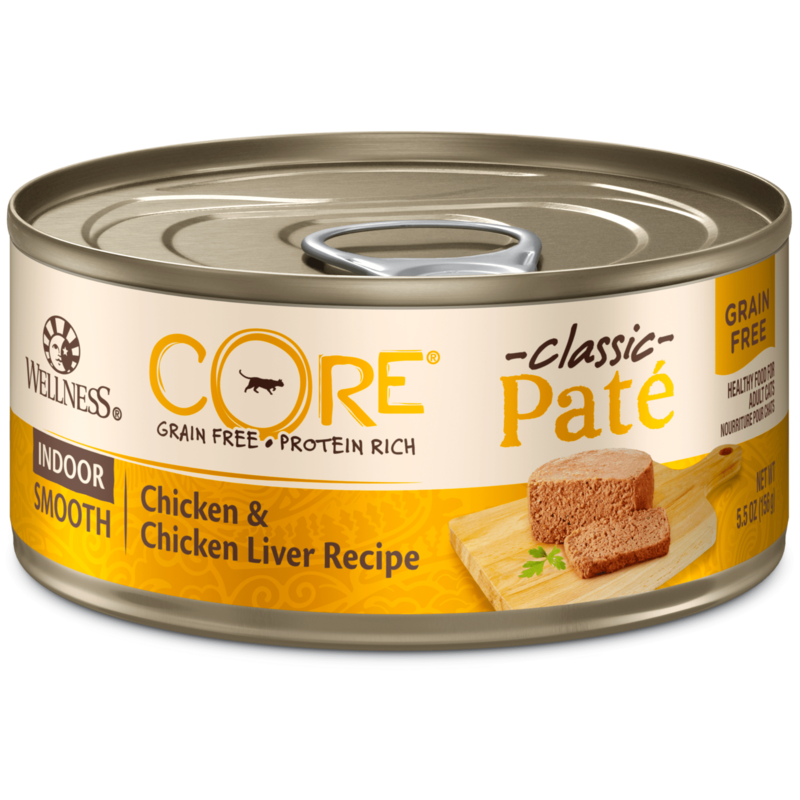 INGREDIENTS: Chicken, Chicken Broth, Turkey Broth, Chicken Liver, Turkey, Chicken Meal, Pea Protein, Pea Flour, Natural Chicken Flavor, Pea Fiber, Ground Flaxseed, Guar Gum, Carrageenan, Potassium Chloride, Cranberries, Taurine, Dried Kelp, Chicory Root Extract, Yucca Schidigera Extract, Alfalfa Meal, Salt, Iron Proteinate, Zinc Proteinate, Vitamin E Supplement, Choline Chloride, Cobalt Proteinate, Thiamine Mononitrate, Copper Proteinate, Manganese Proteinate, Niacin, Vitamin B12 Supplement, d-Calcium Pantothenate, Sodium Selenite, Pyridoxine Hydrochloride, Vitamin D3 Supplement, Riboflavin Supplement, Vitamin A Supplement, Potassium Iodide, Biotin, Folic Acid. 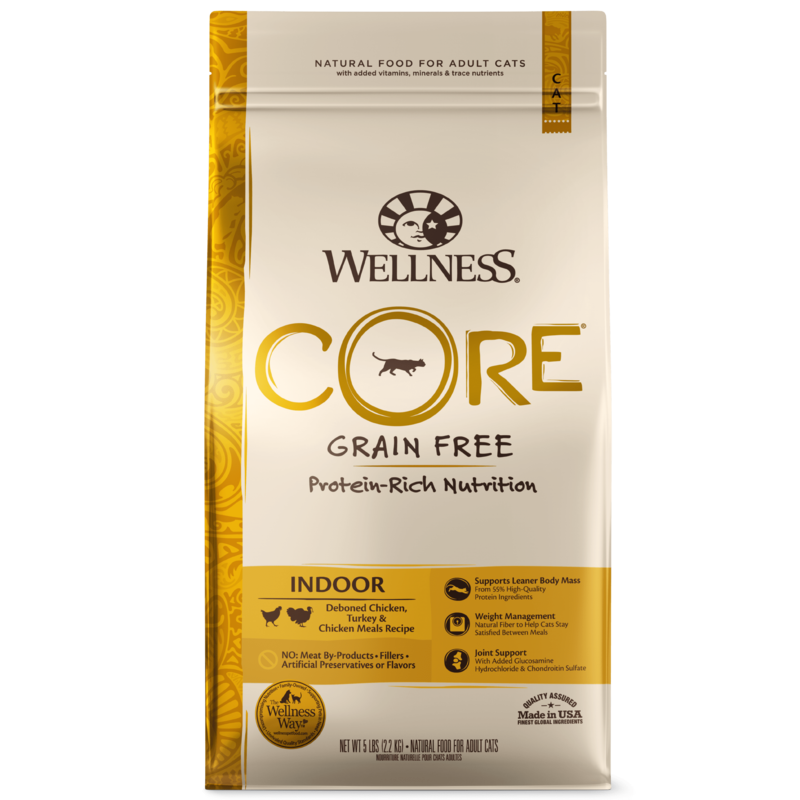 Wellness® CORE® Indoor Formula Adult Cat Food is formulated to meet the nutritional levels established by the AAFCO Cat Food Nutrient Profiles for maintenance. FEEDING INFORMATION: Serve at room temperature. Cover and refrigerate the unused portion. 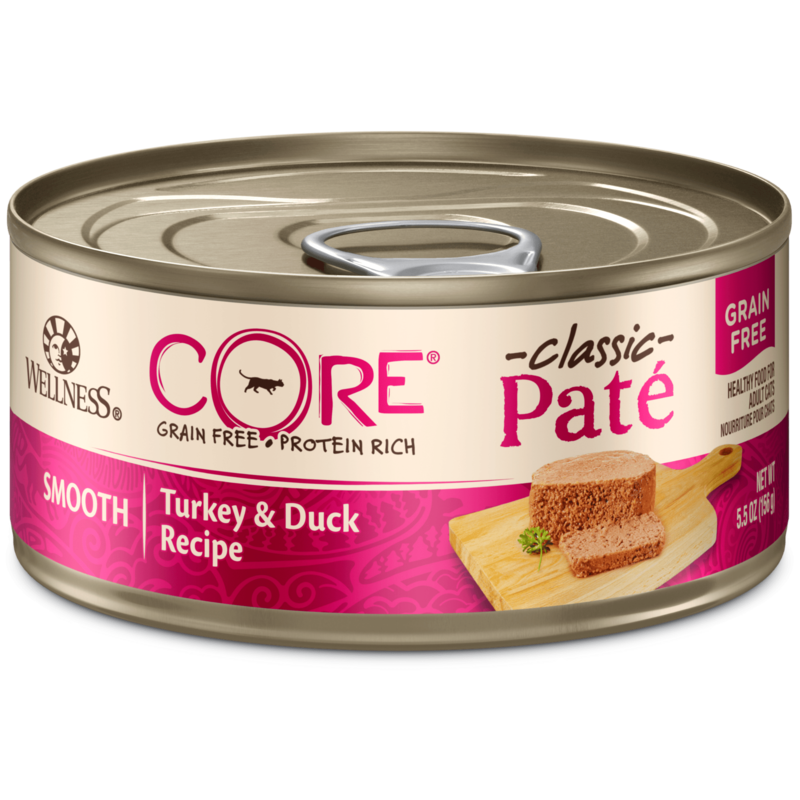 The amount of food your cat requires depends on age, activity level, breed and environment. Always provide access to clean, fresh water. When fed alone to adults, for weight management feed 156g per 3kg of body weight per day. For weight loss, feed 156g per 4kg of body weight per day. For combination feeding, reduce dry by 30g for every ½ can wet. CALORIE CONTENT: This food contains 950 kcal/kg or 148 kcal/can ME (metabolizable energy) on an as fed basis (calculated).